On Sunday, we went to be with my Mom, who turned... well... I don't think she would like her age known.. so I am over 50 and she was close to 30 when I was adopted, hehehe do some math. (octogenarian) I had thought and thought about what to get, procure and or make her as she has in my view way to much stuff anyway, and as I make jewelry... it kind of follows that that is what she got, .. I wasn't sure she was going to like what I finally came up with as she is a Platinum, Gold and Diamonds type lady, very traditional in her jewelry wardrobe while I am a little Hippieish, Goth, maybe Bohemian in my style. But she genuinely loved both the bracelet and the pendant I made for her,,, and my mother does not say she likes something just because I am her daughter, nnnooooooo.. LOL.. so I was pleased and so was she.. HAPPY BIRTHDAY MOM! I called this piece, The Living Heart. 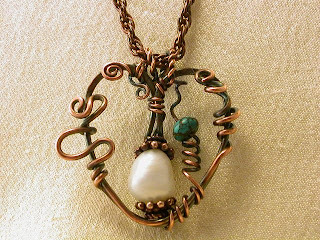 Copper wire formed into a heart with a baroque pearl and a turquoise rondell in a spiral vining pattern.